The Public Works Department currently has staff working around the clockin alternating 12- hour shifts. 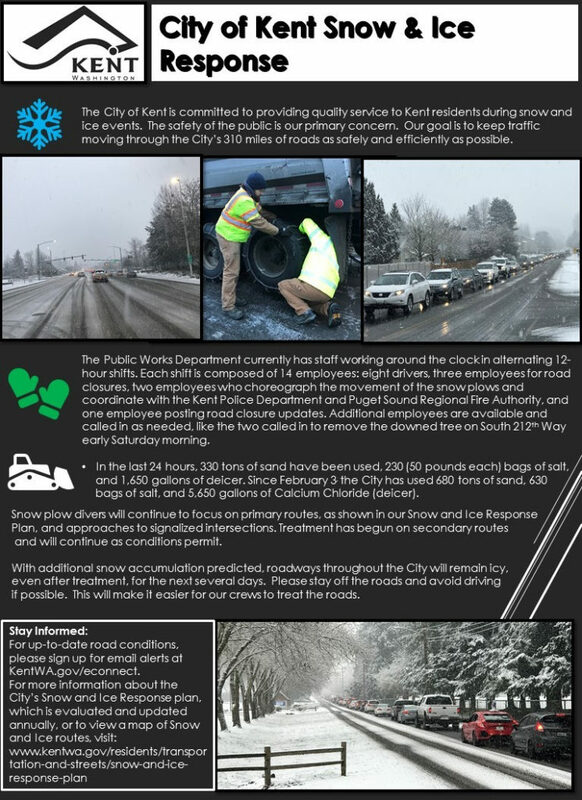 Each shift is composed of 14 employees: eight drivers, three employees for road closures, two employees who choreograph the movement of the snowplows and coordinate with the Kent Police Department and Puget Sound Regional Fire Authority, and one employee posting road closure updates. Additional employees are available and called in as needed, like the two called in to remove the downed tree on South 212th Way early Saturday morning. In the last 24 hours, 330 tons of sand have been used, 230 (50 pounds each) bags of salt, and 1,650 gallons of deicer. Since February, the City has used 680 tons of sand, 630 bags of salt, and 5,650 gallons of Calcium Chloride (deicer). Snow plow divers will continue to focus on primary routes, as shown in ourSnow and Ice Response Plan, and approaches to signalized intersections. Treatment has begun on secondary routes and will continue as conditions permit. With additional snow accumulation predicted, roadways throughout the City will remain icy, even affer treatment, for the next several days. Please stay off the roads and avoid driving if possible. This will make it easier for our crews to treat the roads. Stay Informed: For up-to-date road conditions, please sign up for email alerts at KentWA.gov/econnect. 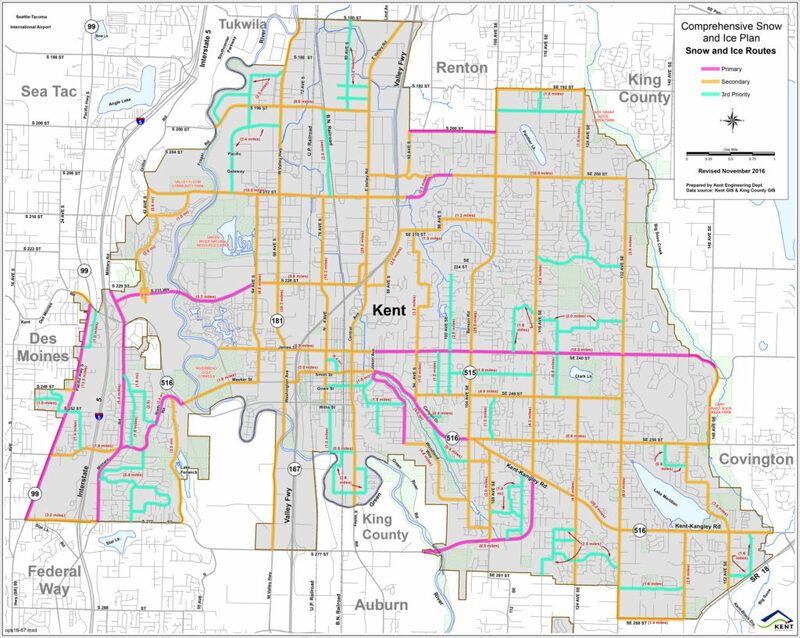 For more information about the City’s Snow and Ice Response plan, which is evaluated and updated annually, or to view a map of Snow and Ice routes, see the map below, or click here (PDF file).